Isaac L. Ginn was enlisted by Capt. Davies at Camp Lee, Ga. June 12, 1863. He was in Co. B, 24th Battalion and through consolidation of units, he was transferred to Co. C, 7th Regiment, Georgia Cavalry. Records show that he was present on all roll calls through October. His horse died July 16, 1864. On November 14, 1864 Pvt. Ginn left his command in Virginia by order of the Command Officer on Horse Detail along with about 200 men of the 7th to go home in Georgia to aquire horses. Most men were not able to find suitable mounts. The plan was to return to Virginia with more horses but even the men with mounts could not return. The Yanks had the route toward Virginia closed. It was December now and Sherman's 66,000 was very close toward Savannah. The men were split in areas with some fighting in South Carolina areas and others blocked at or near home. This was pretty much the end of war for some of those around Savannah. 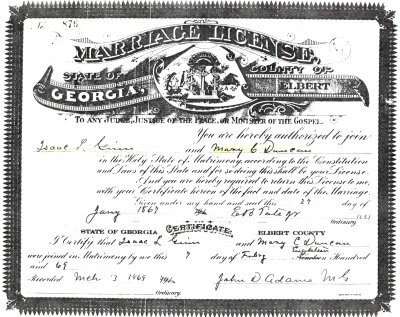 After the war, Isaac Ginn married February 7, 1869 in Elbert County, Georgia with Mary G. Duncan. Isaac L. Ginn died December 27, 1919.